When Avventure Bellissime (“Beautiful Adventures”) was founded in 1999, it was founded on this principle: to offer world-class Italy tours at affordable prices with exceptional customer service at every turn. We’re proud to report that over the past 15 years our guests and clients have consistently reported that we meet and exceed these promises! But while the Avventure Bellissime management team can plan perfect trips and provide them at competitive rates, it’s our Italy travel experts and tour guides that are responsible for that “excellent customer service” we’re praised for. In that sentiment we’re excited to present the “Meet the Avventure Bellissime Team” series wherein we’ll introduce you to members of our expert team. Today, we’d like you to meet Avventure Bellissime Tour Guides Antonella, Max, Francesca, and Kristina. “I attended the International High School of Firenze, where I studied German and English, and then graduated in 1988 from the University of Pisa in 1988. During university, I spent six months in Germany, studying at the Wolfgang Goethe Univeritat in Frankfurt. “After university, I took a year off and lived in Santa Monica, California, taking courses at UCLA to improve my English and learn more about the US. It was a great experience! “When I returned to Italy I taught for several years at high schools, and then set out to become a tour guide. I received my licence in 1998 and have been working as a licenced guide ever since! “I love my job. It’s perfect for me: I adore art, I love talking with people, and I really want visitors to Florence to get to know this place intimately. (Florence is more than just two main squares and two main streets.) Florence is a little treasure, full of important museums, beautiful churches, a charming city center, good food, beautiful wine, and world-class shopping. “My favorite Avventure Bellissime tour is the Original Renaissance Tour, because it is the perfect way to get to know the city from many points of view — a little bit of everything: historical background, hidden parts of Florence, highlights, and the Accademia Gallery with Michelangelo’s David. After the tour, clients can go through the city as if they were at home, knowing what to do and where they can do it, because we give them lot of tips for enjoying the city. Max is an Italian driver guide, and has been a member of the Avventure Bellissime team since 2010. He was born and raised in Rome, spent some time living in California in order to improve his English, and began working in the Italy tourism industry in 2004. 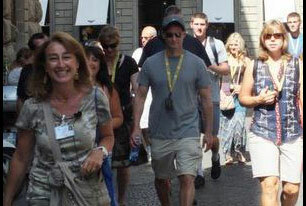 To date, he has experience working and touring all over Italy! When he isn’t leading tours, Max loves to travel, play piano, write music and poetry, and learn new things. Most of all, though, he enjoys spending time with his seven-year-old son, Claudio — his greatest inspiration! “I drive on the coast of Amalfi pretty often, but I never get tired of it! The beauty of the coast is remarkable and it helps make my job truly enjoyable because clients are so happy to see the breathtaking views. “On this tour, we travel the whole coast, passing through many little beautiful villages such as Vietri, (famous for its ceramics), Cetara (home of the popular Tuna festival), Majori, Minori, and Amalfi — where the group can really taste the Mediterranean atmosphere. “Most of all, they get really impressed when I show them the Fiord of Furore! That’s a beautiful picturesque spot where Anna Magnani filmed a few scenes of “L’Amore” by well-known Italian director Roberto Rossellini. But the favorite part of the tour is always Positano, the gem of the Amalfi Coast! What an enchanting place! Many of my clients fall in love with that place. Max’s enthusiasm for his job and for this part of Italy is infectious — his clients are always grateful to have had him as their guide. “My name is Francesca and I’m a native of Rome. After graduating with a degree in Archaeology I became a tour guide and I love my job! I love meeting new people from different parts of the world every day, and I love introducing them to past- and present-life and the history of this beautiful 2000-year-old city. “Many times clients ask me which is my favourite tour. This is a very difficult question as I think every place is unique and deserves to be visited, but Rome is an important one! Certainly to understand how Rome became caput mundi (Latin for “Capital of the World”) and therefore to start understanding its history from the start, the Ancient Rome Tour is the best one. 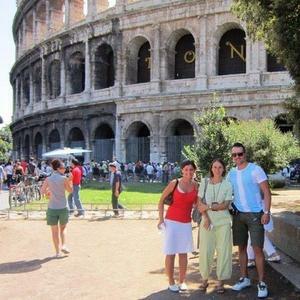 “It is a three hour long tour during which it is possible to understand the evolution of the city from the start until the end of its empire, visiting the symbolic places such as the Colosseum, Palantine Hill, and the Ancient Forum. “My name is Kristina and I am 35 years old. I was born and raised in Slovakia and during university I worked as a tour leader travelling around Europe. In Venice, I met Riccardo and I never left. What a wonderful place to fall in love! Now it has been 15 years and I am in love not only with Riccardo but with Venice as well! “I have been working for Avventure Bellissime as a tour leader for almost 10 years and I think we are really a great team. I love this job! “I think one of the most popular tours in Venice is the Grand Canal Venice Boat Tour. This impressive and spectacular waterway is one you can only see by boat, exploring the minor canals — sort of the secret corners of Venice. “I love giving food suggestions and helping visitors find the places the locals go, discovering new flavors and trying dishes they’ve never had before. 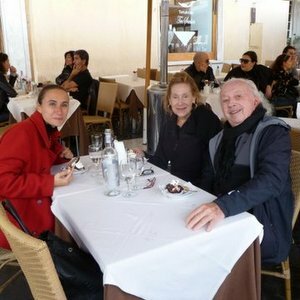 And every time we have the opportunity, I love to let clients try the local wine and Chicchetti — the best gelato in town! Avventure Bellissime clients who get to tour Venice with Kristina regularly report what a great time they’ve had. And stay tuned for information about Avventure Bellissime’s other talented expert licensed Italy tour guides. And if you’re ready to go and see these magical parts of Italy and more, click here. One of Avventure Bellissime’s travel specialists will help you plan the perfect Italian vacation.